In this English Podcast Conversation, we continue talking about learning languages. This is part 2 of the audio. We discuss many of the challenges of learning a language on your own, language acquisition in general, as well as some interesting techniques that we use in our own language studying experiences. Real English Conversations is a website for students that want to start USING their English skills! We offer a mix of real conversations you can join to practice speaking and excellent online lessons that can be studied anytime. Live speaking practice sessions with a teacher and in a small group with other members. Full conversation lessons (like this audio lesson) which also includes speaking practice activities, listening comprehension questions, a full transcription and the MP3 downloads. Access to the Speaking Course, the Phrasal Verb Course and much more! Come to our website or click this link to get started! Do you have the transcript of this video? If you do, could you send me that, please. Thanks! Hi Rachel. Great to hear you are enjoying the podcasts! Yes, we have the full transcription for all 41 podcast lessons available to members of our online courses. 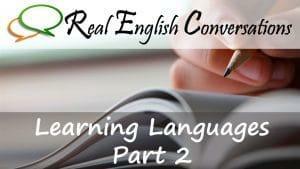 You can find out more by checking out this link: https://realenglishconversations.com/courses/membership-options/. Not only will you get access to the transcript, but also lessons that can help you to improve your listening and speaking skills 🙂 Let me know if you have any questions!